UP AND DOWN THE AVENUES, the buildings in New York City, (considered by many to still be the modern day capital of the art world) are decorated with the work of the world’s best-known artists: Stella, Lichtenstein, Oldenberg, Picasso, Kline, Indiana and de Kooning to name but a few. There are massive paintings and sculptures by these and many other all-time greats housed in lobbies, entrances, boardrooms, parks and offices. Attaining the heights reached by such stalwarts would seem to be the goal of most every artist who sets brush to canvas, chisel to stone or ink to paper. So much art has been created over the centuries that to be merely recognized is an accomplishment; to sustain a life of creativity is a triumph. To be hailed as an all-time great and have your work sell in the millions of dollars while you are still alive—that does happen, even if only to a very select group. There are a myriad of factors that contribute to entering into that realm, no singular formula. Often greatness is in the eye of the beholder, embellished by simple twists of fate, connections and timing. Pure talent, originality and depth of message will only get you so far. Bob Guccione said that it took a great leap of faith to see his artistic dreams come to life. “There was a time,” said a well-known dealer who has placed works in major museums, “when you could succeed just on the quality of the art alone, but today you could be the greatest artist in the world and if you don’t know the right people and have the right friends, you often remain unknown. You have to be a showman and a promoter on a much bigger scale than even in the day of Dali and Warhol, plus you now have to be technically savvy to capture the world market. The world got smaller. You have to be popular everywhere, not just New York, Paris or Spain.” Art is a product now, not just a creation. It needs to be marketed, auctioned and accepted by the mass media. The factors that bring recognition to some and lack of same to others are not simply intangibles any more. Such elements are taught more in business and marketing programs than in art schools. People studying art today are told by their professors to prepare to starve, to find other ways to use their artistic talents so they can earn a living. But if anyone said this to Charles Carson, he certainly wasn’t listening. Hemingway captured the popular imagination with a revolutionary sentence structure, almost militaristic in cadence, that somehow translated into stories of great emotional depth blending despair with valor, hopelessness with redemption, and great love with great loss. It is certainly a valid comparison to put these two side-by-side for indeed Carson is an undisputed master, a Maestro of his own form. 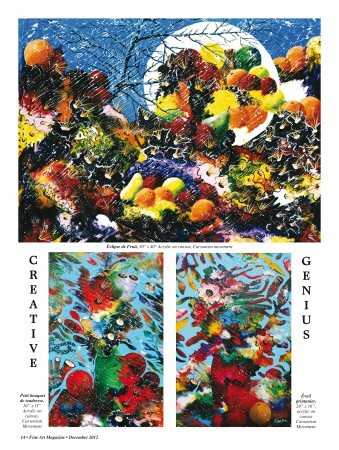 An originator of a visual lingo that knows no bounds, the compositions soar as his spirit allows. Creativity flies, moving ever-onward, staving off unholy forces. 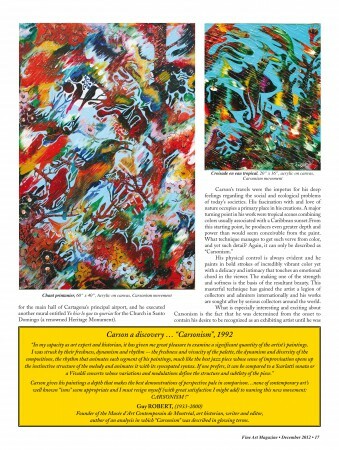 Carson’s paintings strive for perfection like Hemingway’s sentences. There’s not a wasted word nor a misplaced droplet of color. Who paints like this today? Theoretically, it doesn’t matter. Not to Carson because he invented his own very specific mode of expression which involves a very personal creativity. His great gift requires great discipline. Putting the time in, often in solitude, expending the greater part of a 24-hour day painting. However, if science could shine a microscope into a person’s mind and examine his make-up, Carson would outshine many. This decor provided Carson’s first aesthetic feelings and discoveries. These edifices of stone and glass planted the seed of a dream, of a vision of beauty. Where else could a young boy view the transformed light of the sparkling stained glass windows or admire the amazing talent of the artists who sculpted the statutes and painted the images of the Way of the Cross? For Carson, even Sacred music has often consecrated artistic vocations. Silence and contemplation played a subliminal role in creating strong, lasting images. Be it the roar of an ocean or the flow of a river, the excitement of the potential danger manifested in broad strokes of the pallet knife, in blue sheaves and successive waves, to form the pictorial theme of a marine scene in the Carsonism or mosaic movement. 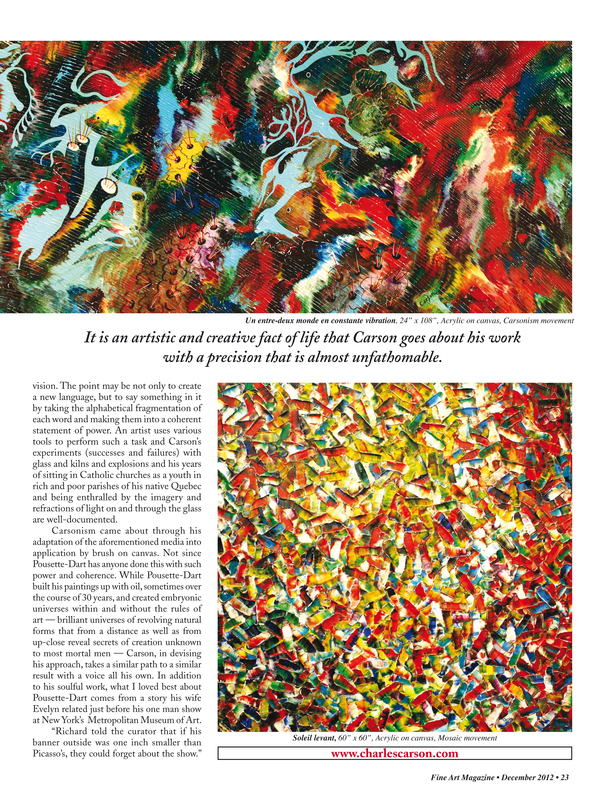 Influenced through his admiration of van Gogh, Cézanne and Turner, at thirty-three, Carson spent time in Latin America where the spirit of inspiration gleaned from Columbian and other landscapes led him to a new personal era of expression through his imagery. 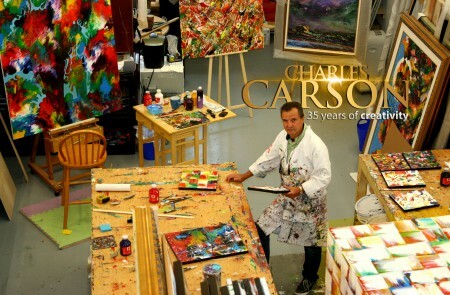 Carson made a name for himself there, where he held numerous exhibitions and developed an amicable relationship with Fernando Botero. While many native artists left for Europe and America in search of fame and fortune, Carson found international recognition from his stay in South America. The influence the painters, topography and people of Colombia exerted upon the young Carson, and the vibrant and ancient culture that he absorbed, is evident in much of his work today. In recognition of his contribution, a life-size statue of the artist in bronze has been on view in a major Cartagena public building since 1997. 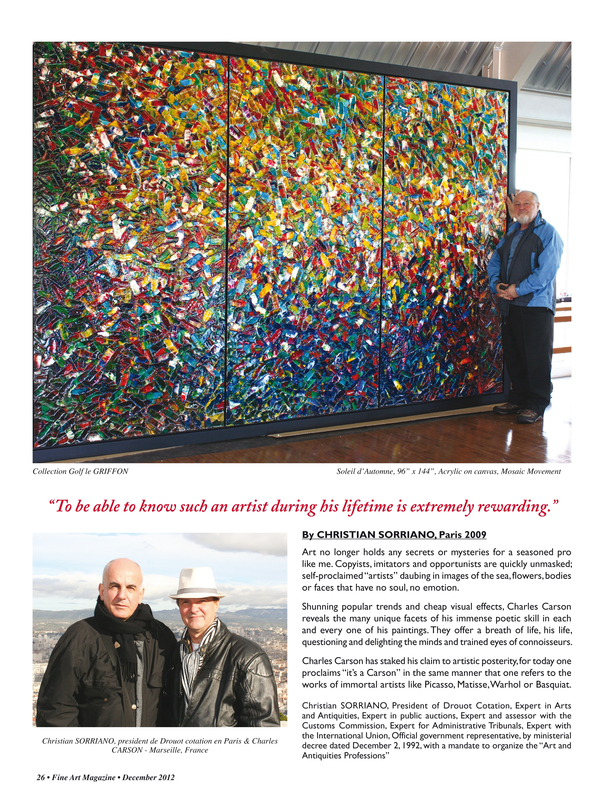 He also created a monumental mural entitled El Caballo del Mar for the main hall of Cartagena’s principal airport, and he executed another mural entitled Yo hice lo que tu querias for the Church in Santo Domingo (a renowned Heritage Monument). There is one constant in all of the analyses and for each of the experts and art historians and it is this: Carson’s work generates energy, an unparalleled “joie de vivre” which is reflected in a mastery of forms and transparency of colors. His physical control is always evident and he paints in bold strokes of incredibly vibrant color yet with a delicacy and intimacy that touches an emotional chord in the viewer. The making one of the strength and softness is the basis of the resultant beauty. 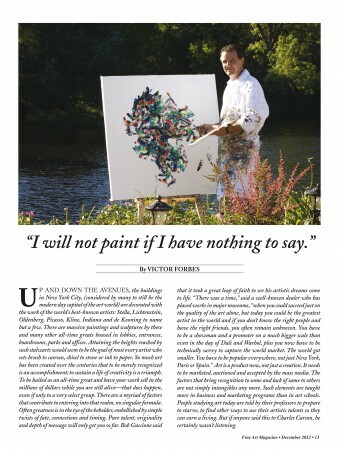 This masterful technique has gained the artist a legion of collectors and admirers internationally and his works are sought after by serious collectors around the world. 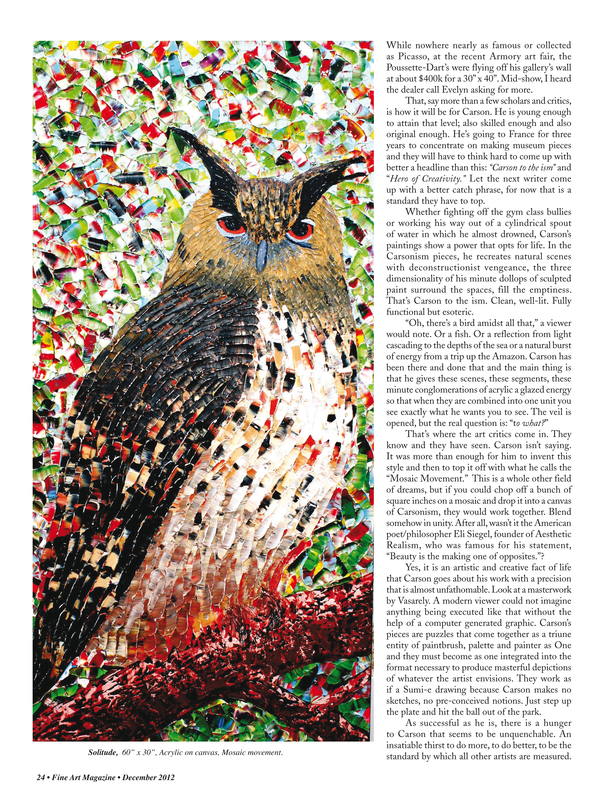 What is especially interesting and exciting about Carsonism is the fact that he was determined from the onset to contain his desire to be recognized as an exhibiting artist until he was confident that his body of work — from the very beginning — would be unique in a world where imitation, appropriation and other flattering forms of self-indulgence were and still are rampant. Carson’s approach was like that of a monk, or a martial artist in training who would not come out to do battle until totally confident that the results would end in victory. Of course, there are no guarantees in this life of anything, yet Carson took that leap of faith, based upon years of study, trial and error and inspiration. Early in his career, the artist employed traditional techniques, gaining inspiration from his environment. His early figurative works left him unsatisfied and he started to lean towards a semi-figurative and extremely personal style of painting. This technique, along with his unique pictorial language rapidly affirmed themselves and his talent was revealed with each new creation. 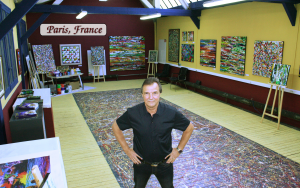 The artist produces extraordinary works that exhibit sensitivity, depth and liveliness, as well as dynamism and variety of composition that characterize his work. 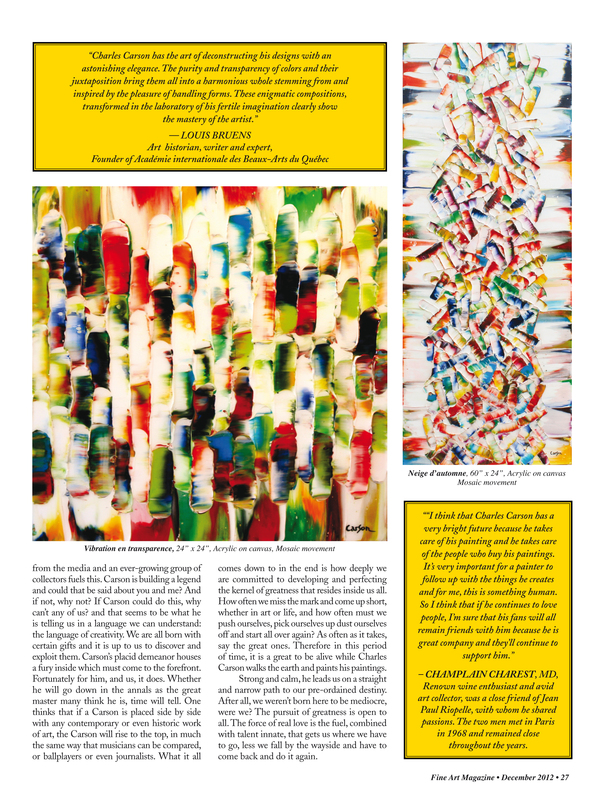 “From an early age, I was in search of other sources of inspiration. I was born with a personality that was exuberant, imaginative and inventive. My inherent curiosity instilled in me the desire to delve beyond a simple explanation of how something worked. My persistence helped me to find answers to many questions – not necessarily the best answers or those that were for my own good. Carson’s imagination led him to a sense of a place beyond, higher, farther, deeper. He was seeking out a unique destiny with other universes to discover. Hence his fascination with the underwater life, so evident in many of his paintings and other universes perhaps yet to be discovered. 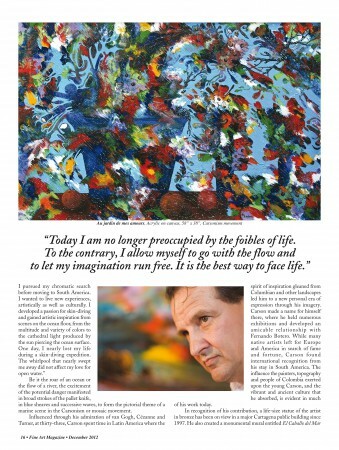 His goal was to create a life for himself as an artist that was not subject to anyone’s authority. Refusing to follow a predetermined path, he greatly preferred the unknown. 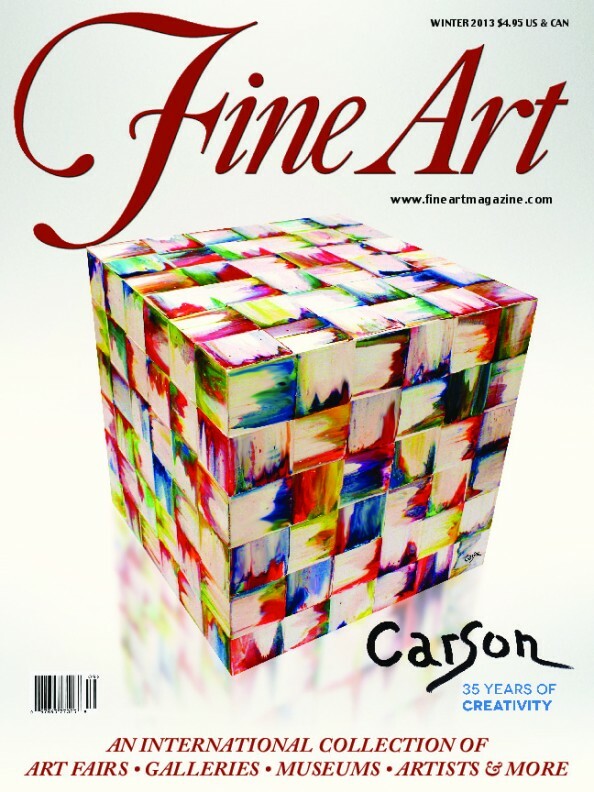 In international art exhibitions, Carson’s work stands alone. His stalls are sanctuaries in which he and the viewers can escape to a tranquil place, inhabited with a realistic presence of the aforementioned storm clouds but marked with a placidity, a bouquet if you will of sweetness and softness. 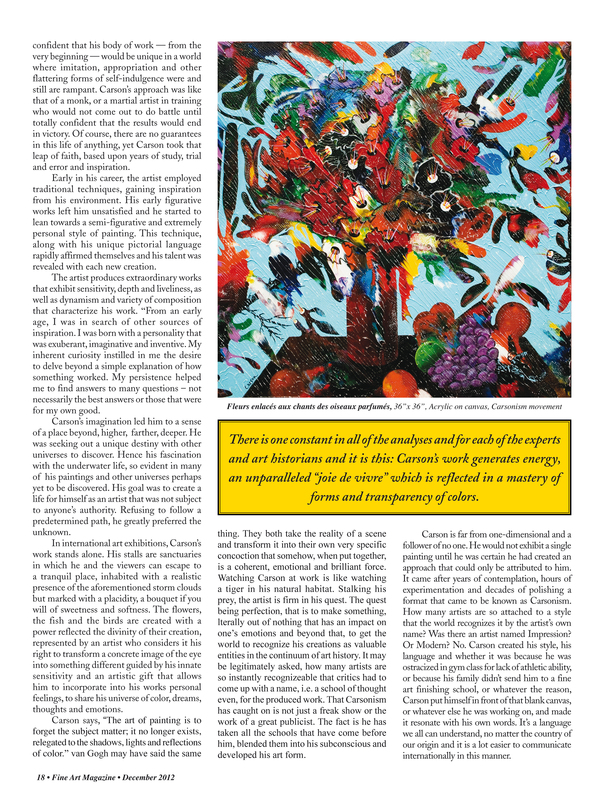 The flowers, the fish and the birds are created with a power reflected the divinity of their creation, represented by an artist who considers it his right to transform a concrete image of the eye into something different guided by his innate sensitivity and an artistic gift that allows him to incorporate into his works personal feelings, to share his universe of color, dreams, thoughts and emotions. Carson says, “The art of painting is to forget the subject matter; it no longer exists, relegated to the shadows, lights and reflections of color.” van Gogh may have said the same thing. They both take the reality of a scene and transform it into their own very specific concoction that somehow, when put together, is a coherent, emotional and brilliant force. Watching Carson at work is like watching a tiger in his natural habitat. Stalking his prey, the artist is firm in his quest. The quest being perfection, that is to make something, lterally out of nothing that has an impact on one’s emotions and beyond that, to get the world to recognize his creations as valuable entities in the continuum of art history. It may be legitimately asked, how many artists are so instantly recognizeable that critics had to come up with a name, i.e. a school of thought even, for the produced work. That Carsonism has caught on is not just a freak show or the work of a great publicist. The fact is he has taken all the schools that have come before him, blended them into his subconscious and developed his art form. 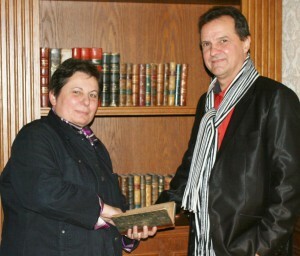 author of an analysis in which “Carsonism” was described in glowing term. “Carson to the ism”. “Hero of Creativity” – Let the next writer come up with a better catch phrase, for now that is a standard they have to top. What Carson has done is invent an approach to life that is that of a warrior wielding a paintbrush for a sword, A ninja in paint. His mannerisms are disciplined. There is no waste or obfuscation. Everything is crystalline. Shining, bright and brilliant, even in the way he operates the front end of his business, travels to exhibits, sets them up, prepares the wall space of an exposition so that every inch is maximized. He is not going down without a fight and every aspect of his creativity is measured. Hemingway’s sentences are short and sweet. Could he write like Fitzgerald or Faulkner or Steinbeck? Maybe. Pollock could draw. He could render so that when a fool looks at a drip masterpiece and says, “My kid could do that,” well maybe. But he certainly couldn’t knock out a realistic charcoal passable sketch which gave Pollock credibility with the so-called cognoscenti. Therefore one might ask, could Carson create in another manner? Maybe is the an­swer again. But it is clear he never wanted to be anything other than an original. What is true about Carson and many other great artists is that they put the time in, often in the deepest of solitudes, to accomplish their vision. This is the part that is most daunt­ing for a human being. Have you read that the author of numerous best-sellers, Harold Robbins, with all the money he needed, had one room painted in his home totally black, with only a desk, typewriter and single pointed spotlight attached from the ceiling to shine over his shoulder onto the matter at hand, in his case words on paper? Carson’s fierce spirit of determination and invention is akin to this. Even the small paintings—not to be confused with a minor work because none of Carson’s work can be deemed mi­nor — contribute to the thematic line of his vision. The point may be not only to create a new language, but to say something in it by taking the alphabetical fragmentation of each word and making them into a coherent statement of power. An artist uses various tools to perform such a task and Carson’s experiments (successes and failures) with glass and kilns and explosions and his years of sitting in Catholic churches as a youth in rich and poor parishes of his native Quebec and being enthralled by the imagery and refractions of light on and through the glass are well-documented. It is an artistic and creative fact of life that Carson goes about his work with a precision that is almost unfathomable. Carsonism came about through his adaptation of the aforementioned media into application by brush on canvas. Not since Pousette-Dart has anyone done this with such power and coherence. 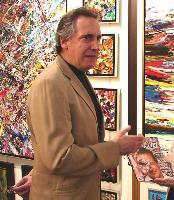 While Pousette-Dart built his paintings up with oil, sometimes over the course of 30 years, and created embryonic universes within and without the rules of art — brilliant universes of revolving natural forms that from a distance as well as from up-close reveal secrets of creation unknown to most mortal men — Carson, in devising his approach, takes a similar path to a similar result with a voice all his own. In addition to his soulful work, what I loved best about Pousette-Dart comes from a story his wife Evelyn related just before his one man show at New York’s Metropolitan Museum of Art. “Richard told the curator that if his banner outside was one inch smaller than Picasso’s, they could forget about the show. How did you grow into becoming an artist? I did not attend a fine arts school despite my desire to do so. Neither my family nor social environment fostered such pursuits. Regardless, this did not inhibit my perpetual search for a pictorial language. The “still life” paintings that I was working at during this time were academic exercises. The subject matter was of little importance. These studies allowed me to explore space and depth, two elements that would be crucial to my future work. I was also doing g lass etching with a diamond tip. By superimposing layers of glass, I produced the three dimensional effect that I was looking for. I experimented with various processes, including: collage, copper, paint and grass. The inspiration came from my discoveryof the magnificent Lalique crystal in Europe. Although this creative technique was received positively, I was not through searching. I continued to perfect my technique for juxtaposing colors, using acrylic to create vivid abstract forms. On a linen canvas, I spread pieces of colored glass, complemented by strokes of acrylic to create an impression of haut-relief. Then, to make the colors explode, I highlighted them with an ultra bright lacquer. I was fascinated and seduced by the art of the master glassmakers of Murano and to emulate their artistry, I heated huge, multi-level ceramic ovens, created moulds and inserted my glazed pieces at a temperature of 2,000 to 3,000 degrees. What kind of artist tools did you employ? 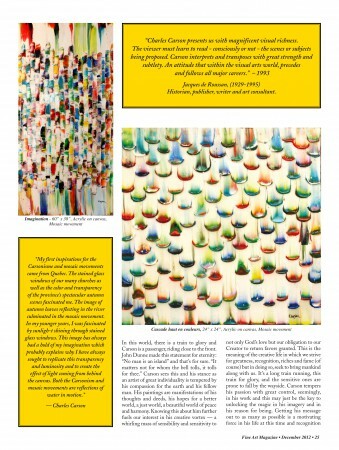 I desperately wanted to reproduce with paint, the textures, forms and transparency of stained glass windows. I used oils, acrylics, pastels and charcoals in my artistic process. All recovery areas served to advance my experimentations for adherence and durability. I spared no effort during these years of experimentation with special effects and contemporary art. I would drop bags of paint from the roof of the house and rush to see the splatters they created on the sidewalk! Or I would use a drill to spin a panel I had coated with different colors of acrylic paint. Not to mention the balloon filled with paint that I would burst over a canvas… I even used an old bicycle wheel to spread colors on a canvas to see the effect it produced. Once, I nearly burned my house down experimenting with a special lacquer. This misadventure brings a smile today. I learned that paint and fire do not make good partners. In my efforts to recreate the “Murano effect”, the wooden roof of my studio as well as the work in progress were reduced to ashes. This incident, as is often the case with fortuitous scientific experiments, allowed me to perfect a mixture of glass and epoxy finished with a blowtorch. I lost count of the number of plaster moulds that were sacrificed for the cause. Not to mention the kilos of glass tiles used during the mosaic experiments. Since those days, I have used an acrylic paint that is more malleable for the textures, dries more quickly and allows for multiple layering of color. 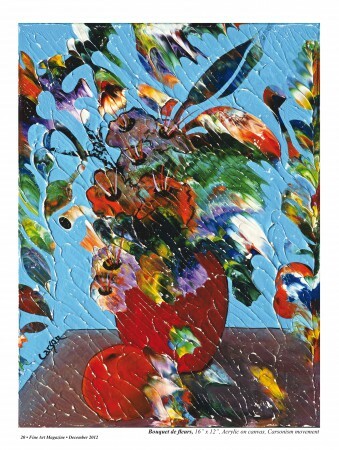 My first subjects were bouquets of flowers, done in an abstract style. 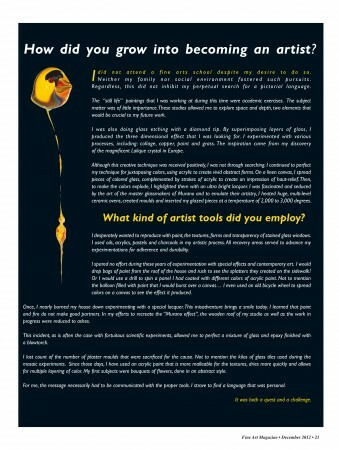 For me, the message necessarily had to be communicated with the proper tools. I strove to find a language that was personal. It was both a quest and a challenge. While nowhere nearly as famous or collected as Picasso, at the recent Armory art fair, the Poussette-Dart’s were flying off his gallery’s wall at about $400k for a 30” x 40”. Mid-show, I heard the dealer call Evelyn asking for more. That, say more than a few scholars and critics, is how it will be for Carson. He is young enough to attain that level; also skilled enough and also original enough. He’s going to France for three years to concentrate on making museum pieces and they will have to think hard to come up with better a headline than this: “Carson to the ism” and “Hero of Creativity.” Let the next writer come up with a better catch phrase, for now that is a standard they have to top. Whether fighting off the gym class bullies or working his way out of a cylindrical spout of water in which he almost drowned, Carson’s paintings show a power that opts for life. In the Carsonism pieces, he recreates natural scenes with deconstructionist vengeance, the three dimensionality of his minute dollops of sculpted paint surround the spaces, fill the emptiness. That’s Carson to the ism. Clean, well-lit. Fully functional but esoteric. 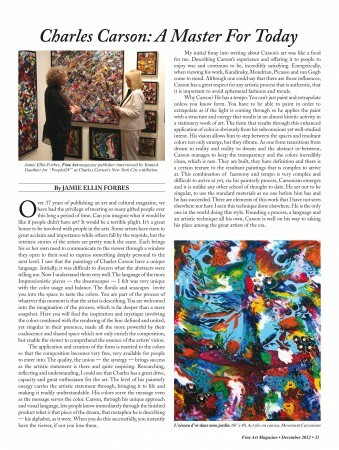 That’s where the art critics come in. They know and they have seen. Carson isn’t saying. 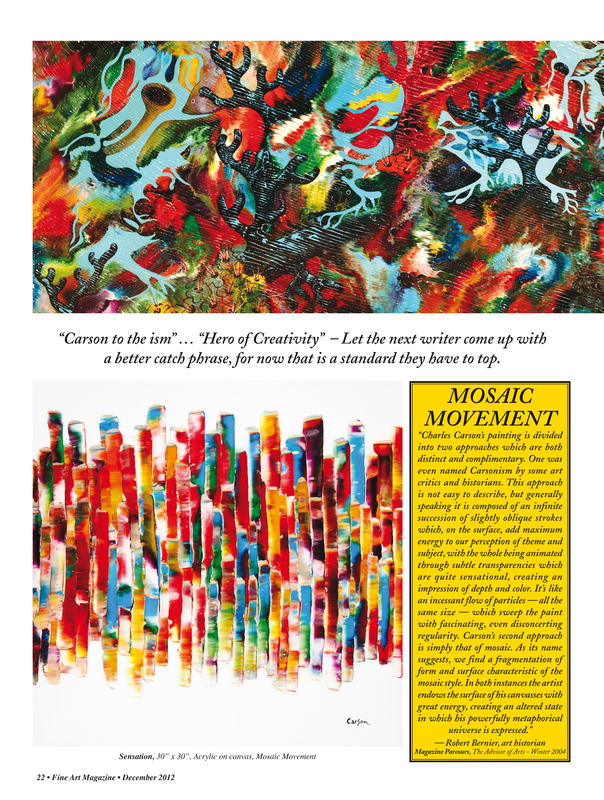 It was more than enough for him to invent this style and then to top it off with what he calls the “Mosaic Movement.” This is a whole other field of dreams, but if you could chop off a bunch of square inches on a mosaic and drop it into a canvas of Carsonism, they would work together. Blend somehow in unity. After all, wasn’t it the American poet/philosopher Eli Siegel, founder of Aesthetic Realism, who was famous for his statement, “Beauty is the making one of opposites.”? Yes, it is an artistic and creative fact of life that Carson goes about his work with a precision that is almost unfathomable. Look at a masterwork by Vasarely. A modern viewer could not imagine anything being executed like that without the help of a computer generated graphic. Carson’s pieces are puzzles that come together as a triune entity of paintbrush, palette and painter as One and they must become as one integrated into the format necessary to produce masterful depictions of whatever the artist envisions. They work as if a Sumi-e drawing because Carson makes no sketches, no pre-conceived notions. Just step up the plate and hit the ball out of the park. As successful as he is, there is a hunger to Carson that seems to be unquenchable. An insatiable thirst to do more, to do better, to be the standard by which all other artists are measured. In this world, there is a train to glory and Carson is a passenger, riding close to the front. John Dunne made this statement for eternity: “No man is an island” and that’s for sure. “It matters not for whom the bell tolls, it tolls for thee.” Carson sees this and his stance as an artist of great individuality is tempered by his compassion for the earth and his fellow man. His paintings are manifestations of his thoughts and deeds, his hopes for a better world, a just world, a beautiful world of peace and harmony. Knowing this about him further fuels our interest in his creative vortex — a whirling mass of sensibility and sensitivity to not only God’s love but our obligation to our Creator to return favors granted. This is the meaning of the creative life in which we strive for greatness, recognition, riches and fame (of course) but in doing so, seek to bring mankind along with us. It’s a long train running, this train for glory, and the sensitive ones are prone to fall by the wayside. Carson tempers his passion with great control, seemingly, in his work and this may just be the key to unlocking the magic in his imagery and in his reason for being. Getting his message out to as many as possible is a motivating force in his life at this time and recognition from the media and an ever-growing group of collectors fuels this. Carson is building a legend and could that be said about you and me? And if not, why not? If Carson could do this, why can’t any of us? and that seems to be what he is telling us in a language we can understand: the language of creativity. We are all born with certain gifts and it is up to us to discover and exploit them. Carson’s placid demeanor houses a fury inside which must come to the forefront. Fortunately for him, and us, it does. Whether he will go down in the annals as the great master many think he is, time will tell. One thinks that if a Carson is placed side by side with any contemporary or even historic work of art, the Carson will rise to the top, in much the same way that musicians can be compared, or ballplayers or even journalists. What it all comes down to in the end is how deeply we are committed to developing and perfecting the kernel of greatness that resides inside us all. How often we miss the mark and come up short, whether in art or life, and how often must we push ourselves, pick ourselves up dust ourselves off and start all over again? As often as it takes, say the great ones. Therefore in this period of time, it is a great to be alive while Charles Carson walks the earth and paints his paintings. Strong and calm, he leads us on a straight and narrow path to our pre-ordained destiny. After all, we weren’t born here to be mediocre, were we? The pursuit of greatness is open to all. The force of real love is the fuel, combined with talent innate, that gets us where we have to go, less we fall by the wayside and have to come back and do it again. 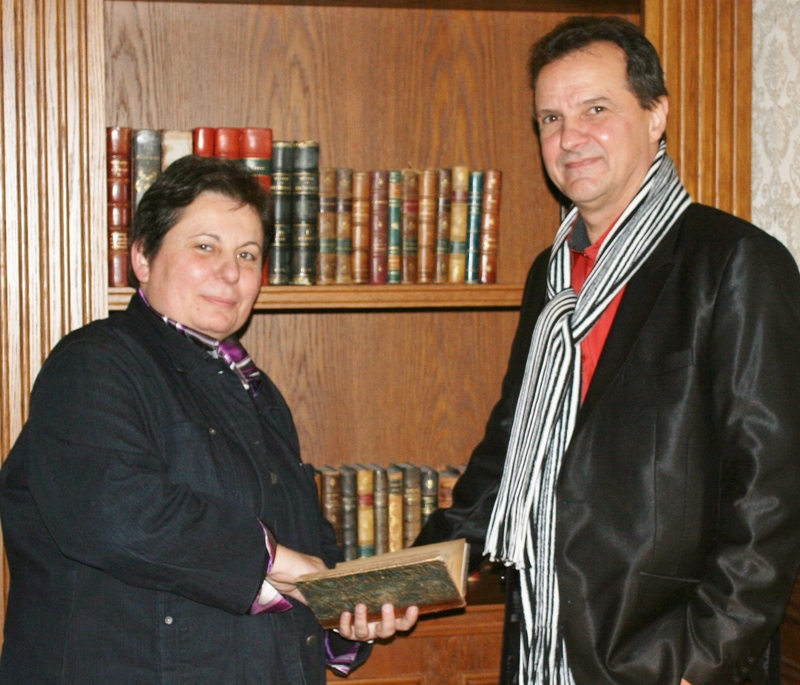 Historian, publisher, writer and art consultant. My first inspirations for the Carsonisme and mosaic movements came from Quebec. The stained glass windows of our many churches as well as the color and transparency of the province’s spectacular autumn scenes fascinated me. The image of autumn leaves reflecting in the river culminated in the mosaic movement. Art no longer holds any secrets or mysteries for a seasoned pro like me. Copyists, imitators and opportunists are quickly unmasked; self-proclaimed “artists” daubing in images of the sea, flowers, bodies or faces that have no soul, no emotion. 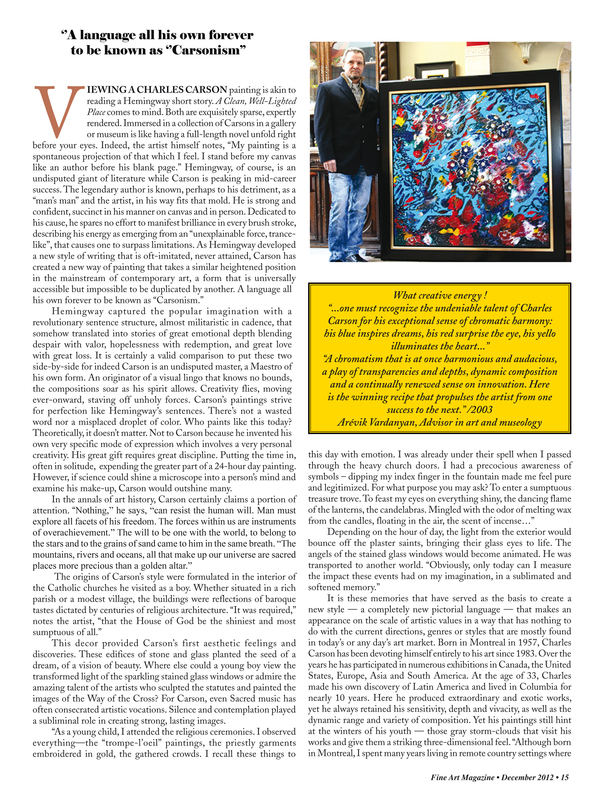 Shunning popular trends and cheap visual effects, Charles Carson reveals the many unique facets of his immense poetic skill in each and every one of his paintings. They offer a breath of life, his life, questioning and delighting the minds and trained eyes of connoisseurs. 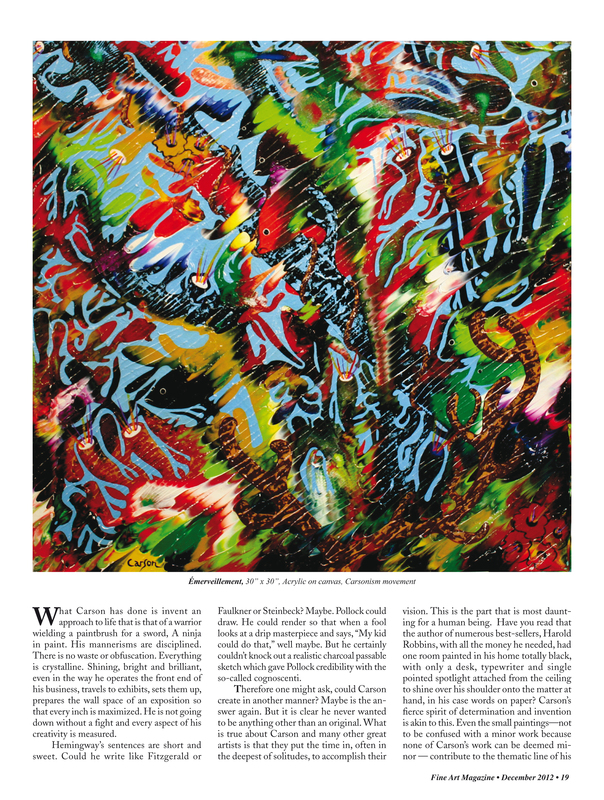 Charles Carson has staked his claim to artistic posterity, for today one proclaims “it’s a Carson” in the same manner that one refers to the works of immortal artists like Picasso, Matisse, Warhol or Basquiat. Carson says he has learned much in his 55 years on this earth. I have learned much simply by observing him, his actions, his work ethic and the response to it. 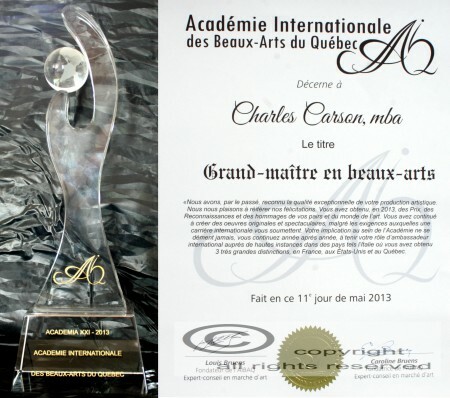 While I have many objects of art in my environment, the Carson stands out as a champion. Not for its size, but for its power. It is a conglomeration of everything the man represents: legitimacy, attention to detail, the yin of softness and the yang of accountability. A light emanates from it. Herein lies the secret to human happiness: get it done and get it done right. There’s a serenity, as if feng shu-ing life from the inside out. Carson makes a case that we can have it all. Teaching by example deep wisdom, Carson’s paintings simplify dichotomies, pinpointing pathways to understanding, what the yogis call self-realization. Hendrix said, “Love can be found anywhere, even in a guitar.” Carson seems to be saying it can be found in a simple brushstroke, a collection of which brings thought to life, a triumph of good over evil. Of mind over matter. Of gain over loss. Thankfully, we have on earth, in our midst, in these pages, a representative of the power of a still, small voice speaking to us amidst the storm. With an artist like Carson at work, it is indeed a good time to be alive, if for no other reason than to see what will be his next creative invention. I am responsible for laboratory analyses and expertise in archeology and works of art, better known as the Laboratoire LAE. Our job is to authenticate works of art, that is, to make a scientific study of a work of art. We analyze the material that defines the essence of an artist in order to thwart forgeries. We analyze the composition of the constituent materials of a work of art in order to discover the gestures, the experience, and the creativity of the artist. I believe that our work is very rewarding and that it’s an opportunity because we get to meet great creators, great artists and beautiful works, which can sometimes be of very humble origin. This is the case, for example, of the first drawings in a decorated cave or the primitive writings of an ancient manuscript. But this can also be a brush stroke of a Leonardo da Vinci or the touch of a van Gogh, a Matisse, a Monet or a Chagall. So many great creators, great artists, who in their own way, help shape our evolution and humanity. I like to say, quite simply, that the works of these great masters are also important and bring as much information as the equations of Albert Einstein. So, you ask me, through all this, where does the work of Charles Carson stand? Well again, we are very fortunate. To be able to know such an artist during his lifetime is extremely rewarding, because we know for a fact that his work will shape our evolution and humanity. Charles Carson is a great creator. His work is inimitable, personal, spontaneous. I don’t know of any other work that resembles his. 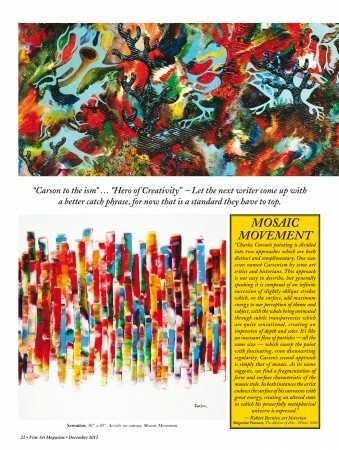 It is halfway between abstract and figurative art, it is not part of any movement or trend. His work is a superposition of materials, of shapes, colors, drawings that create a world of its own that is visually very rich, so rich that it even creates a world of sound. 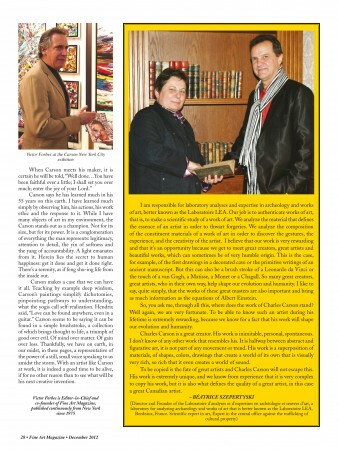 To be copied is the fate of great artists and Charles Carson will not escape this. 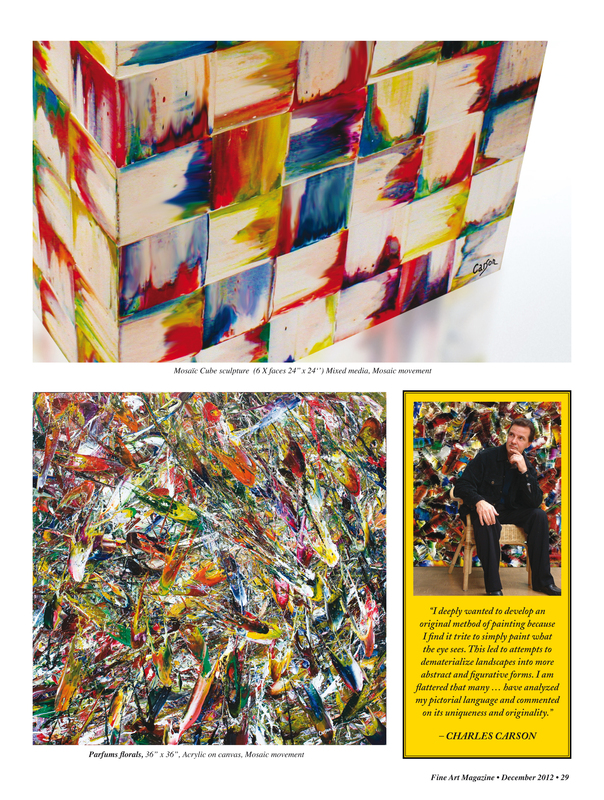 His work is extremely unique, and we know from experience that it is very complex to copy his work, but it is also what defines the quality of a great artist, in this case a great Canadian artist. 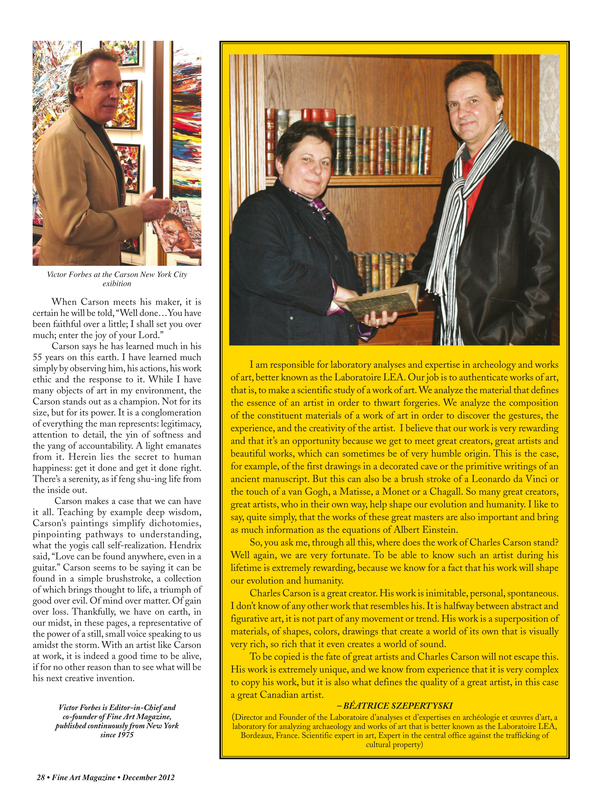 Over 37 years of publishing an art and cultural magazine, we have had the privilege of meeting so many gifted people over this long a period of time. Can you imagine what it would be like if people didn’t have art? It would be a terrible plight. It’s a great honor to be involved with people in the arts. Some artists have risen to great acclaim and importance while others fall by the wayside, but the intrinsic stories of the artists are pretty much the same. Each brings his or her own need to communicate to the viewer through a window they open to their soul to express something deeply personal to the next level. I saw that the paintings of Charles Carson have a unique language. Initially, it was difficult to discern what the abstracts were telling me. Now I understand them very well. The language of the more Impressionistic pieces — the dreamscapes — I felt was very unique with the color usage and balance. 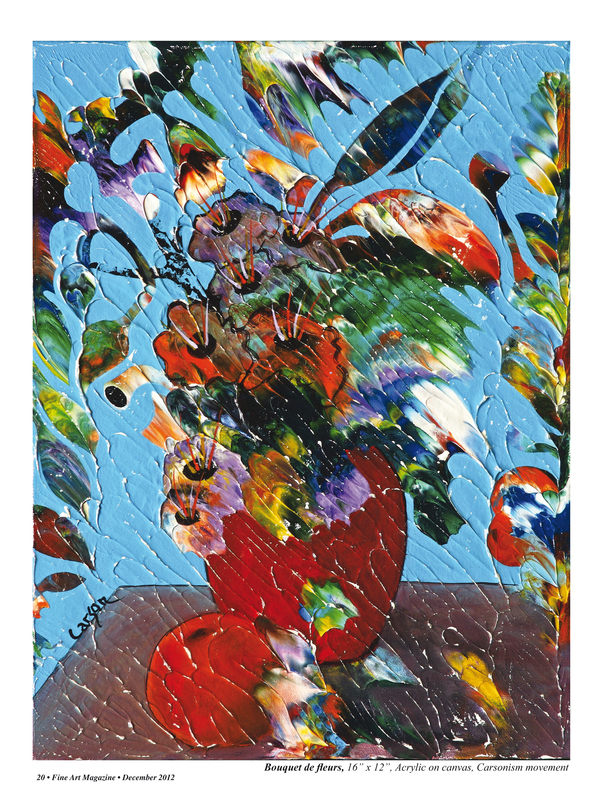 The florals and seascapes invite you into the space to taste the colors. You are part of the process of whatever this moment is that the artist is describing. You are welcomed into the imagination of the process, which is far deeper than a mere snapshot. Here you will find the inspiration and mystique involving the colors combined with the rendering of the line: defined and united, yet singular in their presence, made all the more powerful by their coalescence and shared space which not only enrich the composition, but enable the viewer to comprehend the essence of the artists’ vision. The application and creation of the form is married to the colors so that the composition becomes very free, very available for people to enter into. The quality, the union — the synergy — brings success as the artistic statement is there and quite inspiring. Researching, reflecting and understanding, I could see that Charles has a great drive, capacity and great enthusiasm for the art. The level of his painterly energy carries the artistic statement through, bringing it to life and making it readily understandable. His colors serve the message even as the message serves the color. Carson, through his unique approach and visual language, lets people know immediately through the finished product what is that piece of the dream, that metaphor he is describing — his alphabet, as it were. When you do this successfully, you instantly have the viewer, if not you lose them. 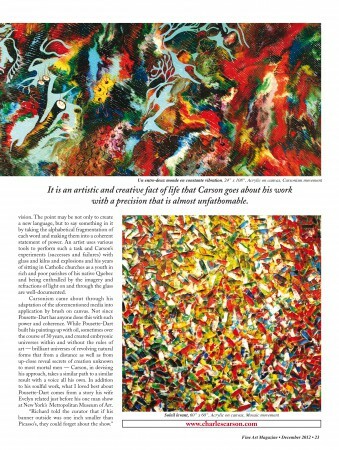 My initial foray into writing about Carson’s art was like a food for me. Describing Carson’s experience and offering it to people to enjoy was and continues to be, incredibly satisfying. 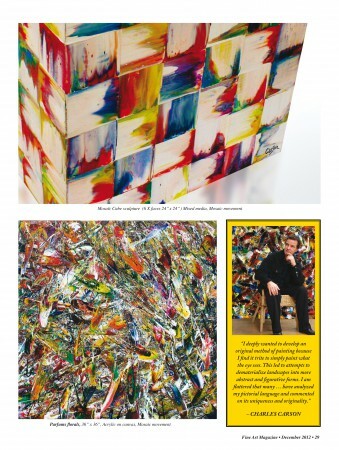 Energetically, when viewing his work, Kandinsky, Mondrian, Picasso and van Gogh come to mind. 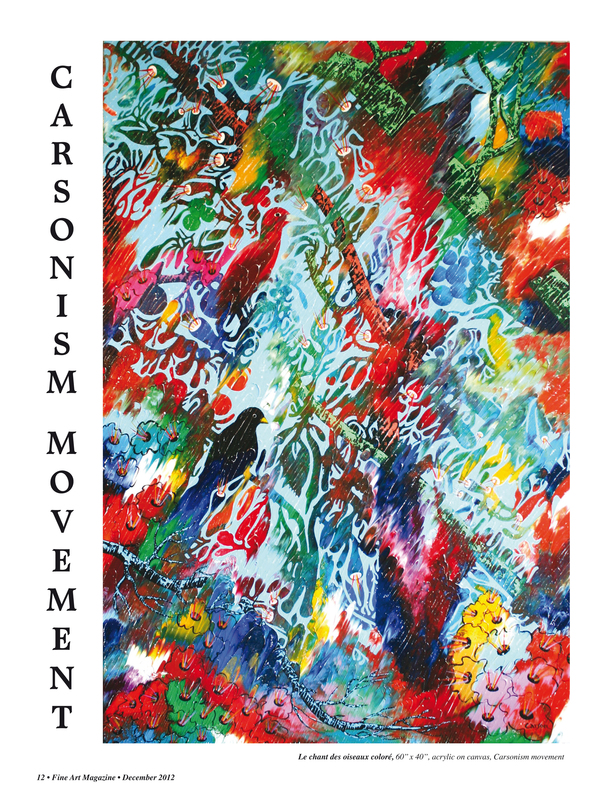 Although one could say that there are those influences, Carson has a great respect for any artistic process that is authentic, that it is important to avoid ephemeral fashions and trends. Why Carson? He has a tempo. You can’t just paint and extrapolate unless you know form. 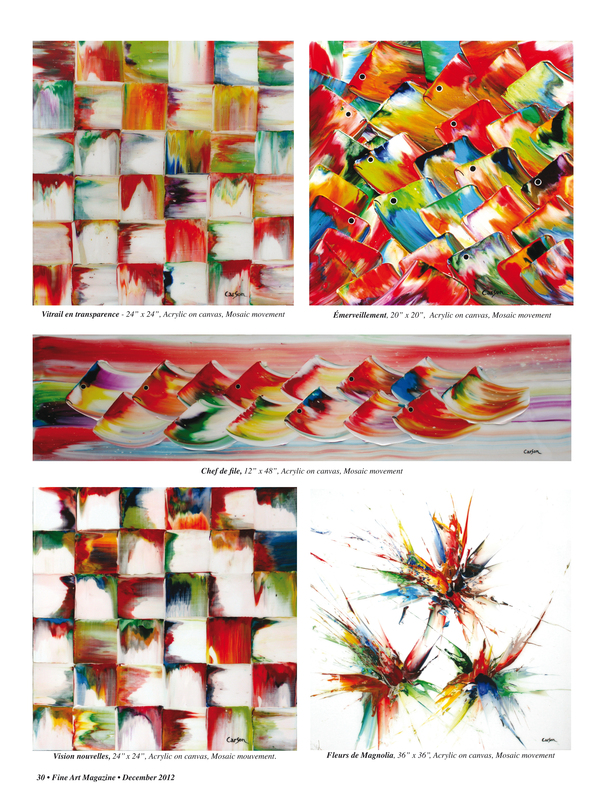 You have to be able to paint in order to extrapolate as if the light is coming through so he applies the paint with a structure and energy that results in an almost kinetic activity in a stationery work of art. The form that results through this enhanced application of color is obviously from his subconscious yet well-studied intent. 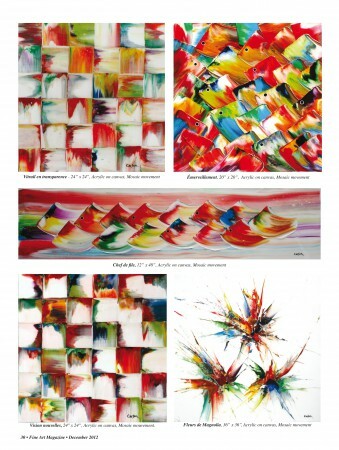 His vision allows him to step between the spaces and resultant colors not only emerge, but they vibrate. As one form transitions from dream to reality and reality to dream and the abstract in-between, Carson manages to keep the transparency and the colors incredibly clean, which is rare. They are built, they have definition and there is a certain texture to the resultant paintings that is complex to arrive at. This combination of harmony and tempo is very complex and difficult to arrive at yet, via his painterly process, Carsonism emerges and it is unlike any other school of thought to date. He set out to be singular, to use the standard materials as no one before him has and he has succeeded. There are elements of this work that I have not seen elsewhere nor have I seen this technique done elsewhere. He is the only one in the world doing this style. 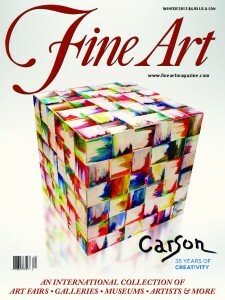 Founding a process, a language and an artistic technique all his own, Carson is well on his way to taking his place among the great artists of the era. « PARIS 2013 – Le peintre des couleurs a trouvé son refuge.